One of America’s most powerful opponents of climate change regulation, Senator Jim Inhofe, has been receiving campaign money traced back to oil giant BP, including chief executive Bob Dudley. The Oklahoma Republican, Jim Inhofe received $10,000 from the BP political action committee (PAC), according to a Guardian exclusive. PACs in the US are set up to assist US companies and trade unions that can’t give direct support to political candidates, who fit their values and business aspirations. Instead, they pool donations from the companies’ higher-ups and the money is then disbursed by a board. BP has maintained in the past its “long-established” attitudes towards the problems of climate change, but it’s not uncommon for names of top oil executives to come up when tracing donations made to people who want to kill climate change legislation. Money from Exxon Mobil chief Rex Teillerson has also found its way to Inhofe and others like him on more than one occasion. 2014 was BP’s most expensive election cycle in more than a decade. Although the company insists it is non-partisan, some 69 percent of PAC money last year went to Republicans. According to data from the Center for Responsive Politics, that is more than any other energy PAC. A total of $1 million was deposited into BP’s PACs by top executives between 2010 and 2014, $655,000 of which was spent on about 40 incumbent senators. Inhofe’s campaign raised $4.84 million from 2009 to 2014, according to CRP. Slightly under half of this came from various PACs, a large portion of which support fossil fuel companies. However, its priority in 2014 was Inhofe, who had two years earlier authored ‘The Greatest Hoax: How the Global Warming Conspiracy Threatens Your Future.’ Records from CRP indicate he was a priority with BP in 2014. And since 2011, Dudley has been funneling very close to the $5,000 per year maximum allowed by law. Figures also indicate Inhofe could easily have beaten his much less funded opponent last November, even without BP’s help. When asked how its recognition of the seriousness of climate change goes hand in hand with its strong Republican bias in PACs, the company wrote in a statement: “Voluntary donations [by staff] to the BP employees’ political action committee in the US are used to support a variety of candidates across the political spectrum and in many US geographies [sic] where we operate. “These candidates have one thing in common: they are important advocates for the energy industry in the broadest sense." 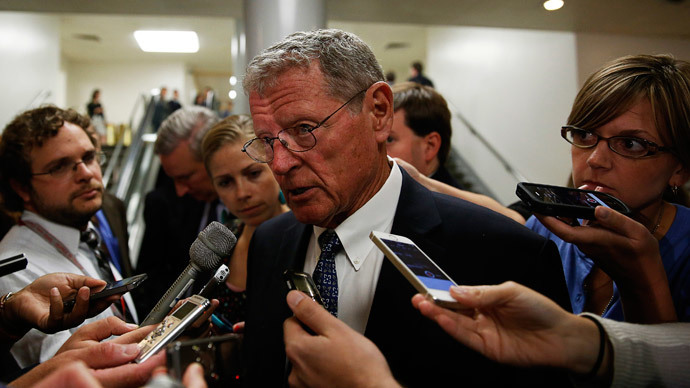 It declined to comment on how Dudley and Inhofe factor into the above. In his rejection of a White House climate change report, Boehner’s colleague and fellow Republican, Senator Mike Enzi of Wyoming, told local news in May that Obama’s policies aren’t geared toward fighting climate change, just making it harder for businesses to operate. PACs aren’t the only thing keeping politicians going, nor are they the only thing at oil giants’ disposal to pursue their favorite candidates’ victories. BP has been spending millions on lobbying outside of PACs as well, according to CRP, who classifies it as a “heavy hitter” and ranks it in the top 140 of the biggest donors to federal elections since 1988.